This article is about the Greek dish. For other uses, see Gyro (disambiguation). "Gyros" redirects here. For the moth genus, see Gyros (moth). A gyro or gyros[a] (Greek: γύρος, gyros [ˈʝiros], literally 'turn') is a Greek dish made from meat cooked on a vertical rotisserie. 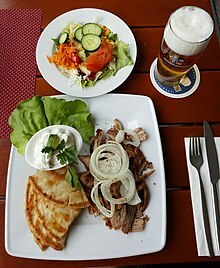 Like shawarma and tacos al pastor, it is derived from the lamb-based doner kebab. In Greece it is now most often pork, or chicken, while a mixture of beef and lamb is common in the U.S. and other countries. It is usually served wrapped or stuffed in a flatbread such as pita, with tomato, onion, tzatziki sauce, and sometimes french fries. Grilling a vertical spit of stacked meat slices and cutting it off as it cooks was developed in Bursa by Turks in the 19th century Ottoman Empire, and called doner kebab (Turkish: döner kebap). Following World War II, doner kebab made with lamb was present in Athens, introduced by immigrants from Anatolia and the Middle East. A distinct Greek variation developed, often made with pork and served with tzatziki sauce, which later became known as gyros. By 1970, gyros wrapped sandwiches were already a popular fast food in Athens, as well as in Chicago and New York City. At that time, although vertical rotisseries were starting to be mass-produced in the US by Gyros Inc. of Chicago, the stacks of meat were still hand-made. According to Margaret Garlic, it was she who first came up with the idea to mass-produce gyros meat cones, after watching a demonstration by a Greek restaurant owner carving gyros on the What's My Line? television show. She convinced her husband John Garlic, a Jewish former Marine and at the time Cadillac salesman, of the idea. After obtaining a recipe from a Greek chef in Chicago, the couple rented a space in a sausage plant in Milwaukee and began operating the world's first assembly line producing gyros meat from beef and lamb trimmings. The Garlics later sold their business to Gyros Inc., which along with Central Gyros Wholesale, and Kronos Foods, Inc, also of Chicago, began large-scale production in the mid-1970s. The name comes from the Greek γύρος ("circle" or "turn"), and is a calque of the Turkish word döner, from dönmek, also meaning "turn". It was originally called ντονέρ (pronounced [doˈner]) in Greece. The word ντονέρ was criticized in mid-1970s Greece for being Turkish. The word gyro or gyros was already in use in English by at least 1970, and along with γύρος in Greek, eventually came to replace doner kebab for the Greek version of the dish. Some Greek restaurants in the US, such as the Syntagma Square in New York City—which can be seen briefly in the 1976 film Taxi Driver—continued to use both doner kebab and gyros for the same dish, in the 1970s. In contrast to other areas of Greece, in Athens, the skewered meat dish souvlaki is known as kalamaki. A pita-wrapped sandwich made with either gyros meat or kalamaki is known as a souvlaki. The Greek pronunciation is [ˈʝiros], but the pronunciation in English is often /ˈdʒaɪroʊ/ or, occasionally /ˈɡɪəroʊ/ or /ˈjɪəroʊ/. In Greek, "gyros" is a nominative singular noun, but the final 's' is often interpreted as an English plural in the U.S., leading to the formation of the singular "gyro". In Greece, gyros is normally made with pork, though other meats are used. Chicken is common, and lamb or beef may be found more rarely. Typical American mass-produced gyros are made with finely-ground beef mixed with lamb. For hand-made gyros, meat is cut into approximately round, thin, flat slices, which are then stacked on a spit and seasoned. Fat trimmings are usually interspersed. Spice mixes generally include salt, hot and sweet paprika, white and black pepper, dried parsley, garlic powder, and oregano. Additional spices are sometimes added (e.g. cinnamon, nutmeg, cumin, anise, coriander, fennel, allspice, sumac). The pieces of meat, in the shape of an inverted cone, are placed on a tall vertical rotisserie, which turns slowly in front of a source of heat or broiler. As the cone cooks, lower parts are basted with the juices running off the upper parts. If the meat is not fatty enough, strips of fat are added so that the roasting meat always remains moist and crisp. The rate of roasting can be adjusted by varying the strength of the heat, the distance between the heat and the meat, and the speed of the spit rotation, allowing the cook to adjust to varying rates of consumption. The outside of the meat is sliced vertically in thin, crisp shavings when done. In Greece it is generally served in an oiled, lightly grilled piece of pita, rolled up with sliced tomatoes, chopped onions, fries, and tzatziki. ^ English: /ˈdʒaɪroʊ, ˈʒɪəroʊ-, ˈjɪər-, ˈɡɪər-/. ^ Prichep, Deena; Estrin, Daniel. "Thank the Ottoman Empire for the taco al pastor". pri.org. Retrieved 19 March 2017. ^ a b Simopoulos, Artemis P.; Bhat, Ramesh Venkataramana Bhat, eds. (2000). Street foods. Basel: Karger. p. 6. ISBN 9783805569279. OCLC 41711932. ^ "Sports Illustrated". Vol. 3. Time, Incorporated. 1955. p. 116 – via Google Books. ^ a b c d Kremezi, Aglaia (2010). "What's in the Name of a Dish?". In Hosking, Richard (ed.). Food and Language: Proceedings of the Oxford Symposium on Food and Cooking 2009. Oxford Symposium on Food and Cookery. Prospect Books. pp. 203–204. ISBN 978-1-903018-79-8 – via Google Books. ^ a b c Glaser, Milton; Snyder, Jerome (7 December 1970). Spit and Image. New York Magazine. New York Media, LLC. Retrieved 18 October 2018 – via Google Books. ^ "The Gyro, a Greek Sandwich, Selling Like Hot Dogs". The New York Times. September 4, 1971. p. 23. Retrieved February 22, 2016. ^ a b c David Segal (July 14, 2009). "The Gyro's History Unfolds". The New York Times. Retrieved June 4, 2016. ^ Γιάκωβος Σ. Διζικιρικής, Να ξετουρκέψουμε τη γλώσσα μας 'Let Us De-Turkify our Language', Athens 1975, p. 62, proposes substituting γυριστό for ντονέρ, but The New York Times was already using the word gyro in English in 1971 (4 Sept. 23/1) according to the OED, 1993 online edition, s.v. ^ Martin Scorsese (director) (1976). Taxi Driver (Motion picture). Columbia Pictures. Event occurs at 0:06:05.